Another one for the "only in Japan" file! Definitely bizarre in its own fascinating way, Dog's Way (Inu Michi) tells the story of a relationship between a man (Masayuki Yano) and a woman (Nagayama Yurie) who voluntarily becomes his dog. 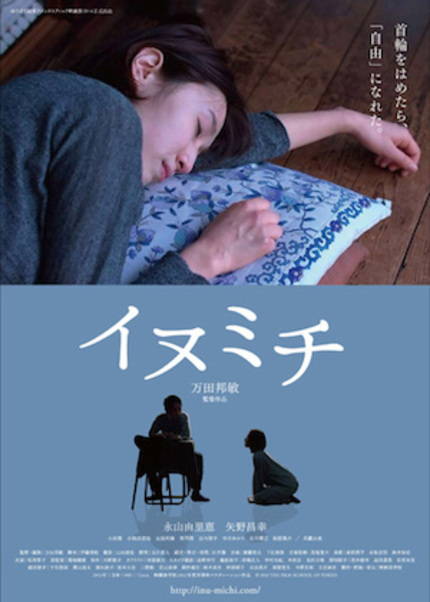 Manda Kunitoshi, the film's director, has won two prizes at the 2001 Cannes Film Festival for his absorbing, but peculiar drama Unloved. If you're by any chance familiar with Sugiura Akiyoshi's weird and cute 2007 comedy Cat Girl Kiki the premise of this movie might not surprise you as much as it should. Then again, this means that you watch too many Japanese films, just like we do. Kyoko feels unsatisfied with her ordinary days although she has a job and a boyfriend. One day, she meets Nishimori, a man with vacant "dog" eyes. This mysterious encounter is the beginning of her new life as Nishimori's dog. In a closed house, they get deeply absorbed in the strange relationship as "a dog" and "its owner". First trailer arrived today just in time for the film's world premiere at Yubari International Fantastic Film Festival this weekend. Check it out below!